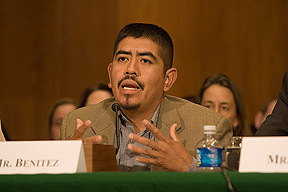 The historic hearing in the US Senate — the first ever specifically called to look into labor conditions in Florida’s fields, the nation’s largest producer of fresh tomatoes and, for many years, of shameful headlines of farmworker slavery and exploitation — was called to order at 10:00 am Tuesday morning by the Chairman of the Senate Committee on Health, Education, Labor, and Pensions, Senator Edward Kennedy (middle). 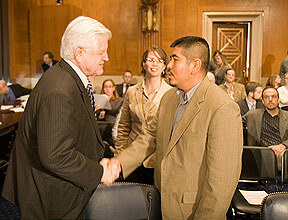 But before the formalities began, there was an opportunity for some personal exchanges between the senators and the day’s witnesses, including this warm moment between Senator Kennedy and Lucas Benitez of the CIW. During his opening remarks, Sen. Kennedy graciously mentioned that Lucas was a 2003 laureate of the Robert F. Kennedy Human Rights Award. 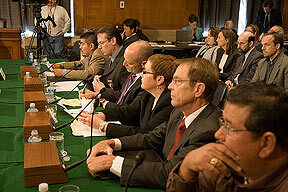 The senators also shared their contempt for the efforts of the state’s largest tomato industry lobby, the Florida Tomato Growers Exchange, to whitewash the exploitation of the industry’s workers with exaggerated figures for average tomato harvesters’ wages and denials of responsibility for the many federally prosecuted cases of slavery to emerge from the fields in recent years. Here, Senator Durbin asked those gathered to, “do the math with me.” He went on to explain that workers would have to fill and empty a 32-pound bucket of tomatoes, each worth about 45 cents, about every two minutes all day long to earn the $12.50. “Is that possible? I don’t think it is,” he said. 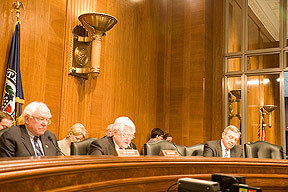 With the opening remarks concluded, the day’s six witnesses began their testimony, with 5-10 minutes of prepared remarks followed by questions and answers from the committee members. 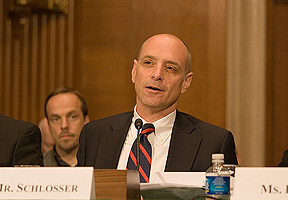 The witnesses included, from top left to bottom right, Lucas Benitez of the CIW, Detective Charlie Frost of the Collier County Sheriff’s Department Anti-Trafficking Unit, author Eric Schlosser, attorney Mary Bauer of the Southern Poverty Law Center, Reggie Brown of the Florida Tomato Growers Exchange, and Roy Reyna of Grainger Farms. “Exactly 200 years ago, in an act now mostly forgotten in the pages of history, the Congress of the United States voted to end the importation of slaves into this country. 200 years ago, the opponents of that law argued that the slaves were happy with their lot, that they were certainly better off than where they came from, and that agriculture in this country would surely collapse if this law were to pass. 200 years ago, the choice before Congress seemed complicated and controversial. But in the end, the people’s representatives voted in favor of human rights and so advanced the cause of human dignity. See a full transcript of Lucas’s prepared remarks by clicking here. See a full transcript of Det. 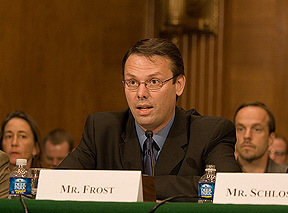 Frost’s testimony, and of all the witnesses’ written submissions, by clicking here. 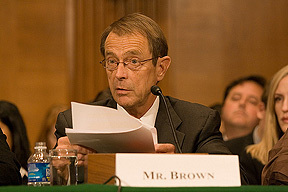 Again, for the record, Mr. Brown did not answer Mr. Schlosser’s question. 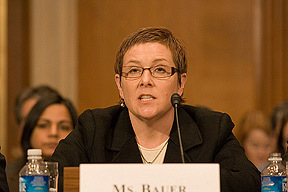 “As some growers began to implement the Yum/McDonald’s agreement – an extra paycheck cut to the farmworkers by the buyers, not the growers, mind you – the Florida Tomato Growers Exchange (FTGE), representing 90 percent of the state’s growers, said any members who adopted this policy would be fined $100,000 per worker benefiting from the agreement. “WASHINGTON — Delivering a victory to farmworker groups that complain of paltry wages on Florida farms, senators said Tuesday they’ll ask federal investigators to determine whether migrant farm workers are being paid as much as the tomato industry claims. 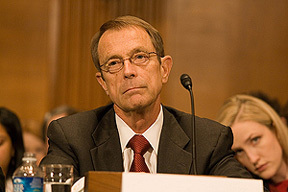 The call to have the Government Accountability Office investigate came as Sens. 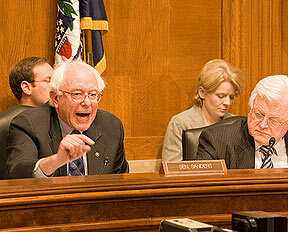 Edward Kennedy, D-Mass., and Bernie Sanders, I-Vermont, pledged to back efforts to boost pay and improve working conditions for thousands of migrant workers picking tomatoes in Immokalee and throughout Florida. ”This is the beginning, this is not the end,” said Sanders, who toured the Collier County farming community in January and said he found the living conditions for workers ”deplorable.” He said the committee was likely to push for greater protection of farmworkers, including changes to federal trafficking statutes. 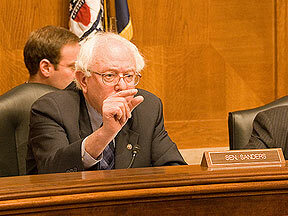 Sanders also questioned the tomato industry’s contention that tomato pickers make an average of $12.50 per hour. Most farms guarantee workers at least a minimum wage of $6.79, but pay them based on the number of buckets picked. For every 32-pound bucket, the worker gets a token typically worth 45 to 50 cents. And so, stay tuned, as there will surely be more to come on the fast-developing Congressional front in the Campaign for Fair Food!